Born in Berlin, George Grosz spent his early life moving with his mother to and from Stolp, where he began private drawing lessons in 1901, after the death of his father. He was expelled from school in 1908, but in 1909 entered the Royal Academy in Dresden, from which he graduated with honors. Although a large part of Grosz’s work attacks the military, the artist initially volunteered for the army in 1914. After a year at the Front, he suffered a nervous breakdown, which he saw as a physical and psychological revolt against military violence. In 1917, he was drafted back into the army, but avoided actual service, spending time in a sanitarium instead. It was also during this year that the Malik Verlag began publishing his graphic works. Around the time of the 1918 November Revolution, Grosz focused his pictorial attack on what he later termed “The Pillars of Society”: the military, the clergy, and above all, the middle class. It was during this period that Grosz joined the Dada movement, the German Communist Party (KPD), and the Internationale Arbeiterhilfe, through which he had contact with fellow members Otto Dix and Käthe Kollwitz. Due to a mistrust of ideology in general, Grosz was not a very active member of the KPD, but he did remain loyal to the party for several years. When asked to create pro-KPD posters, Grosz left in order to avoid turning his art into propaganda. This break coincided with a 1922 visit to Moscow, where Grosz was disillusioned by the numerous social problems he saw in the Soviet Union. However, he remained a committed socialist, and in 1924, he became a leader of the Rote Gruppe, an organization of left-wing, socially conscious artists. Grosz’s constant satirical attacks on the rampant corruption in capitalist society got him into legal trouble. In 1920, his portfolio God on Our Side was confiscated, and Grosz was arrested and fined for attacking the military. Two years later, he was fined again, this time for the defamation of public morals in his portfolio Ecce Homo. Grosz also seems to have been acutely aware of the danger of the Nazi Party. As early as 1925, he began ruthlessly ridiculing Adolf Hitler and issuing increasingly strong warnings about the danger of Nazism. By 1929, the political climate in Germany had swung right, and Grosz became endangered. 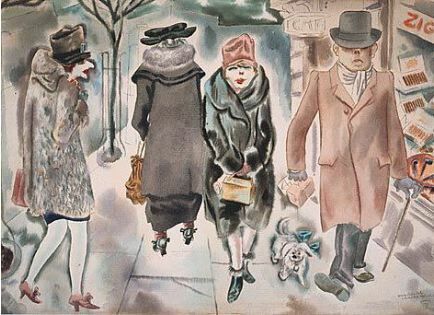 In 1933, as the Nazi party was voted into power, Grosz traveled to the United Stated to teach; he ended up sending for his family and becoming a citizen in 1938. Though Grosz was out of physical danger, his art remained under attack. In 1937, several of his works were hung in the “Degenerate Art” exhibit sponsored by the Nazi government. Grosz remained in the United States until 1958, when he returned to Germany; he died the following year in Berlin.